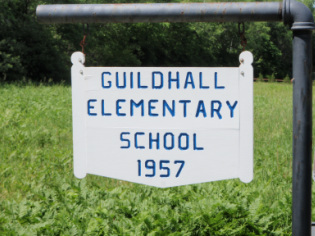 The Guildhall School Board consists of three members, one of whom is elected annually by the voters of Guildhall. Current members are Marie Fay, Karen Guile, and Christina McGrath. For more information on the Guildhall School, and for School Board agendas and minutes, please visit the ECSU's website. For School-related notices, please refer to the School notices page, on which notice for each meeting is posted. The agenda for each meeting can be found on the corresponding notice, and agendas are also available through the above-linked ECSU page (see the link under "Guildhall School Board"). * If you would like to be on the agenda, use the contact form on the bottom-right corner of this page to contact the Board. or her full intellectual, creative and physical potential through a fully integrated curriculum. We encourage students to become life-long learners by sustaining intellectual curiosity and a thirst for discovery and achievement. We embrace a safe and supportive school environment that fosters a diverse community based on mutual respect and social responsibility, enhanced by a strong partnership between home and school. The above information is provided as a courtesy. Official documents are available via the Essex Caledonia Supervisory Union.